So today, I’ve partnered with some friends and fellow food bloggers for a virtual baby shower for the lovely Katherine of Love in My Oven (she’s one awesome blogger and such a sweet person). All of us have come together to bring you pink-hued recipes to celebrate her baby girl. 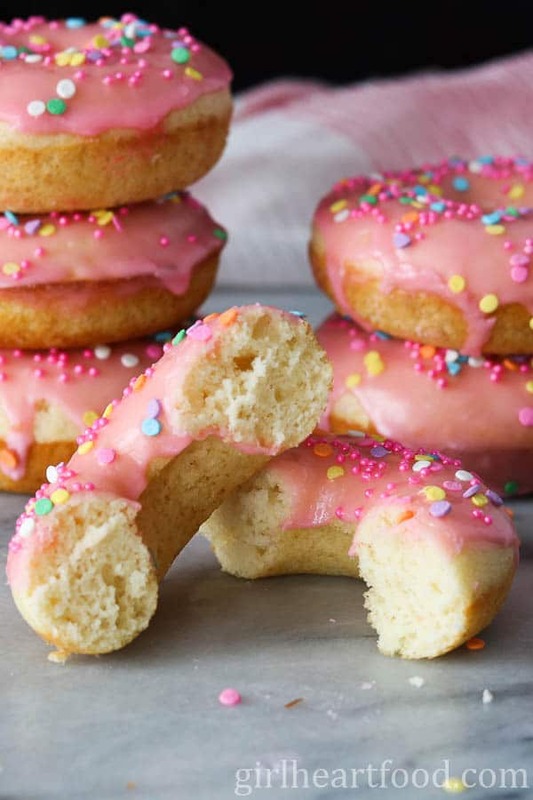 My contribution is these easy vanilla glazed baked donuts (sprinkles optional but not really, if you ask me). 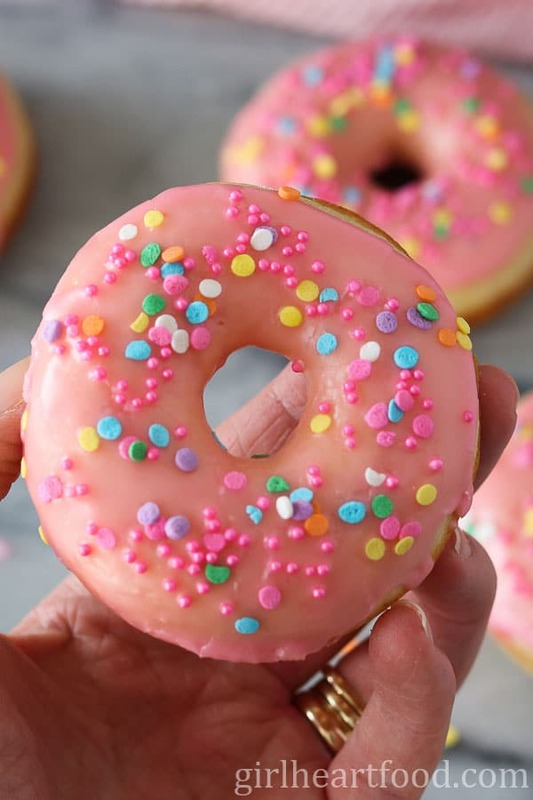 Have you made your own donuts at home? Couldn’t be simpler! My life changed when I purchased a donut pan (ok, tad dramatic, but it was so worth it). I didn’t realize how easy homemade donuts were to make and because these are baked, they are so much better than their fried counter part. Dare I say maybe you could eat two 😉 ? I used the tiniest bit of pink gel food colouring for the vanilla glaze. That stuff is capital ‘P’ potent!! Dip the tip of a wooden skewer into the gel pot and swirl it into the vanilla glaze until you’ve reached the desired colour that makes you happy. If you prefer to skip the colouring, that’s a-ok too! The pink colour is just to make it more festive for a baby shower and doesn’t affect the taste or anything. And, fair warning, if you often wear a lighter nail polish (like me) don’t you dare get that colouring on your nails. Ain’t nobody got time for that, lol. So, what’s your favourite thing to enjoy with donuts? Coffee? A cold glass of milk? I’d have to say for me it would be coffee and I gotta dunk! And I ain’t gonna lie…if it’s, like, 9pm on Saturday night I just maaaaay enjoy one of these bad boys with a glass of vino. Don’t forget to check out more pinked themed baby shower recipes below! Whether you’re celebrating or just want something to brighten your day, your bound to find it in this round up. Hope you enjoy these fun vanilla glazed baked donuts! Until next time, take are and chit chat again soon! Preheat oven to 425 F. Spray 6 unit donut pan with Pam. Stir together flour, sugar, baking powder, and salt. To flour mixture, add milk, egg, melted butter, and vanilla extract. Using a hand mixer, blend for a minute or two. Distribute donut batter in greased pan. Bake on middle rack of oven for 7-8 minutes or until toothpick inserted comes out clean. Carefully remove from oven and let rest 10-15 minutes before removing donuts from pan. Let cool completely on wire rack before icing. Combine all ingredients in a bowl and whisk until smooth. Note - if using the gel food colouring, I suggest using a tiny amount on the tip of a toothpick to swirl into icing sugar mixture (a little goes a long way). 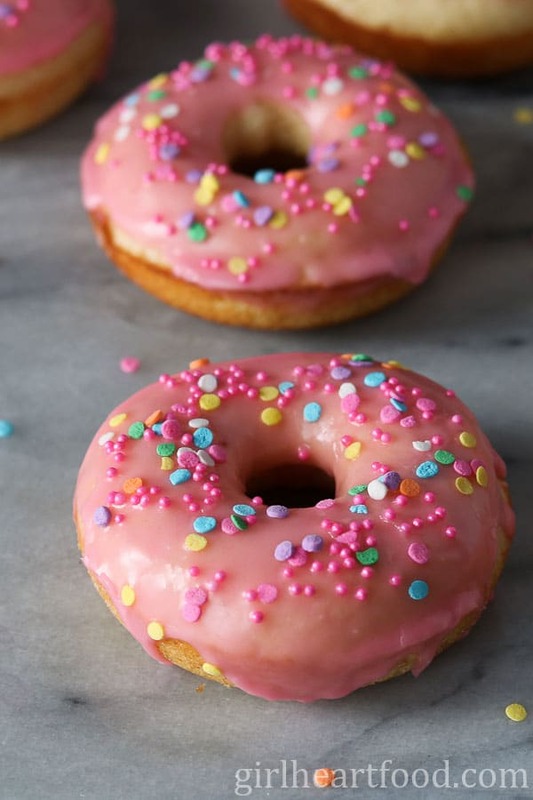 Invert donuts into glaze and distribute sprinkles over top. Place on wire rack and let glaze set for 10 minutes or so. Enjoy! Meet our guest of honor: Katherine! Katherine blogs over at Love In My Oven and is the proud momma to two boys and a soon-to-arrive baby girl!! You don’t need to know Katherine to join in the fun, just enjoy all of the pink themed recipes the bloggers are bringing to the party! Scroll down to see what the other bloggers are sharing! Thank you Emily 🙂 They sure are – gotta love pink!